In this article, Physio Logic Pilates Instructor Julie Olival, discusses the benefits of Pilates for mothers identifying habitual actions, common tendencies within those movements, and counter exercises to strengthen the muscles required for those actions to move more efficiently and prevent injury. Physio Logic Pilates Instructor and Mother, Julie Olival, practicing a plank variation with the assistance of her two and a half year old daughter, Zoe. We are not static beings. We are dynamic. Every day we all perform various tasks, habitually. It’s crucial we perform those actions in a way that is beneficial to our body and its long-term health. At one point in my life, the actions I performed most were intricate dance choreographies. Currently, the actions I perform most are lifting my toddler, lifting my toddler, and lifting my toddler. Did I say lifting my toddler? My new occupation as a mother is no less laborious than that of a dancer. Any parent or caretaker will also understand those physical demands. I’ve found it imperative to study my body with the same lens I used as a dancer to prevent strains or injuries that can occur with repeated actions. However, given the demands of motherhood and work, I have to be efficient with my time. My Pilates practice has evolved to become much more abbreviated, but has remained detailed and productive. Therefore, I apply my teaching ethos to my own Pilates sessions and construct routines that counter the physical activity of parenthood and promote proper bio-mechanics. Customize a session that strengthens the muscles required to move efficiently and ease fully through performed actions. 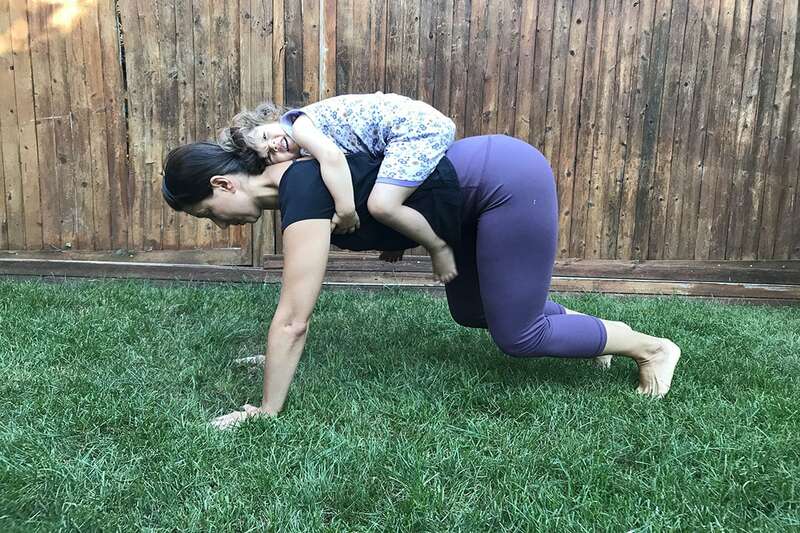 Below is a brief movement analysis of the Parent/Caretaker of an infant or toddler along with some suggestions for Pilates exercises that I would recommend for rehabilitating from these habituated actions. It’s my hope that some of these suggestions can alleviate some of the aches and pains associated with caring for a tiny human. This philosophy of rehabilitating the body from poor patterning is inherent in a Pilates practice. Balancing strength, stability, and mobility are at its root. I’d be remiss not to mention how good it feels to deliberately care for our own physical well-being in tandem to the extraordinary care we give our children. Common tendency: rounding shoulders forward. Counter with: Pec Stretches and Scapular Stability exercises to strengthen the Rhomboids, Low Traps, Serratus Posterior. Exercises for External Rotators of the shoulder and Spinal Extensors. Suggestions include: rowing, chest expansion (or any arm work with a Thera-Band, Reformer or Cadillac springs), cat/cow, serratus push-ups, swimming—or any prone extension exercise. Take a nice stretch over a Physio-Ball, in a doorway or with a towel after your shower to stretch your pectoral muscles. Common Tendency: lumbar lordosis (swayback). Counter with: Strengthening Transverse Abdominis and Pelvic Floor. Suggestions Include: pelvic floor lifts, posterior tilting of the pelvis, bridging up with an articulated spine, 100’s, cat pose, planking from hands and knees with a head/tail curve. Concentrate on dropping the tailbone towards the floor. Kneeling knees series can be done on the Reformer with a rounded spine. Common Tendency: hoisting body upward awkwardly with misaligned pelvis. Suggestions Include: squats and lunges from standing position, and simply practicing tucking one shin beneath you and getting up via a lunge or all fours position. Common Tendency: sitting into one hip and overusing one arm. Suggestions Include: strengthen arms with weights. Standing on a block—or side lying, abduct the opposite leg away from the midline. Side bending with stable pelvis. Common Tendency: rounding forward in the shoulders, dropping chin towards chest, and overusing forearms. Suggestions Include: lye vertically along a roller with arms out to the side and flex the wrists (pull fingers towards the floor). Sitting on your knees, put back of the wrists on the ground with fingers towards your knees, and perform prone extensions like swimming. Additionally, keep wrists in line with forearm when pushing a stroller, and all five fingers over the bar if possible to avoid strain in the wrists and hand. These suggestions are geared toward the caregiver, but no matter what your daily routine is, allow your Pilates practice to counter your habituated movements for a more balanced body. Interested in learning more about how Pilates can help you rehabilitate from habituated movements and actions? Schedule an appointment with one of our Pilates Instructors today. Fill out the form below to get started. Tell us what your goals are with Pilates and/or yoga.